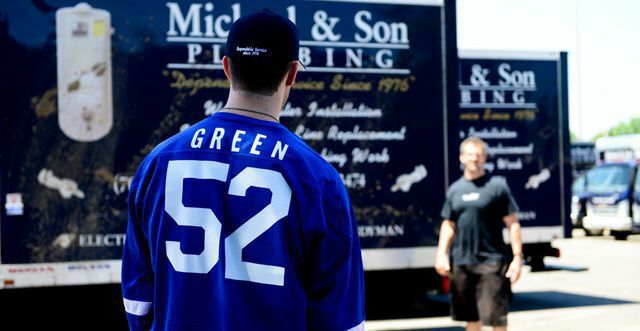 By far the most successful project we’ve done for Michael & Sons was a video project that starred Mike Green, an NHL defenseman for the Washington Capitals. 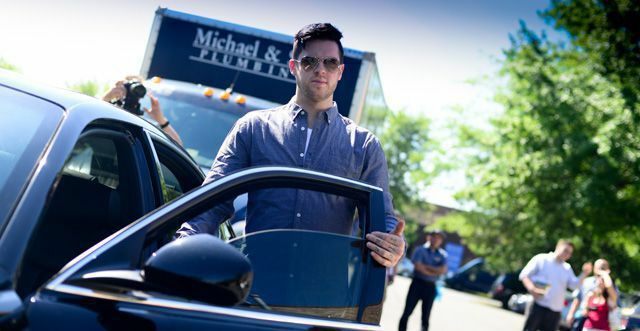 This was to be part of a web series, not a TV commercial, and its main focus was to highlight the rigorous customer service training all employees of Michael & Son undergo. 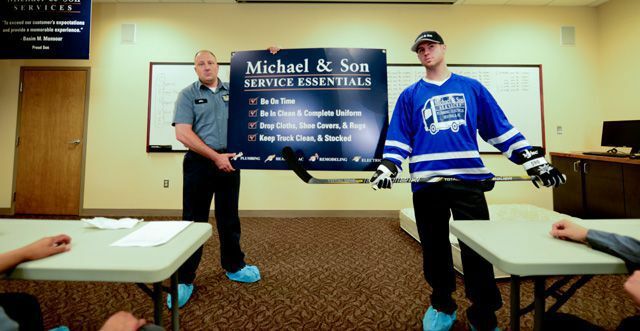 Mike Green was featured as “The Office Enforcer” used by “Michael & Son University,” a training course used to ensure that all employees are given the skills they need to provide the best possible customer service. The veteran hockey player’s role would be to enforce the rules that technicians at Michael & Son must follow in order to remain “the best of the best.” To do so, Mike donned a hockey jersey, in-line skates, and quite literally slammed anyone who failed to be on time, be in clean and complete uniform, use drop cloths, wear shoe covers, and keep the trucks clean and stocked. Michael & Son owner Basim Mansour wanted this video—like all of their recent videos—to be light-hearted and fun. Basim is a funny guy who loves a good prank, and we wanted this spirit to come across in his promotional videos and commercials. Over the years we have found that the videos that resonated the most with Michael & Son’s audience were those that included some humor, so centering this celebrity feature video around a humorous theme was a no-brainer. This shoot was no exception, as the blooper reel at the end of the video proves. The video was a smash hit, and at the time of this case study it had over 133,000 views! I have to say that this was one of the most entertaining shoots Don and I have done. The atmosphere in the office is dynamic and it’s easy to see why Michael & Son has enjoyed the success it has. Mike Green, Basim, and the entire staff made the shoot exciting, and there were many times when laughter took over. What a great atmosphere! The challenge with a celebrity project is the inevitable time restrictions. 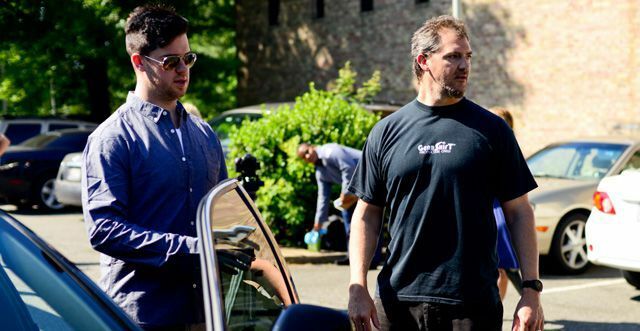 You only get the celebrity for set time, so making sure you get all the shots you need can put the pressure on. However, in this shoot, everything went smoothly and we were able to get all the footage we needed to produce the video within the four-hour timeframe that we had with Mike Green. 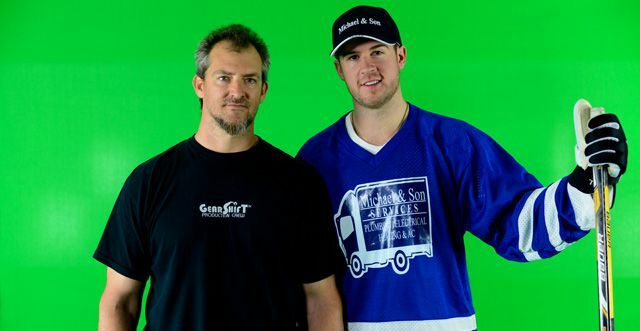 Up next for Michael & Son is a series of commercials. We are using the tag line “If you can’t, we can!” Each of the videos will reference historic points in time, and should be a blast to shoot. The first will feature a Foster Web Marketing employee, Matt Casey, who, with his luxurious beard, will make the perfect caveman. I look forward to every shoot with Michael & Son, and am excited to see what successes they will achieve next.